of errors that was our flight from Massachusetts to California. Asthma attacks and vomit fests were the theme. Let’s pick up where we left off, shall we? 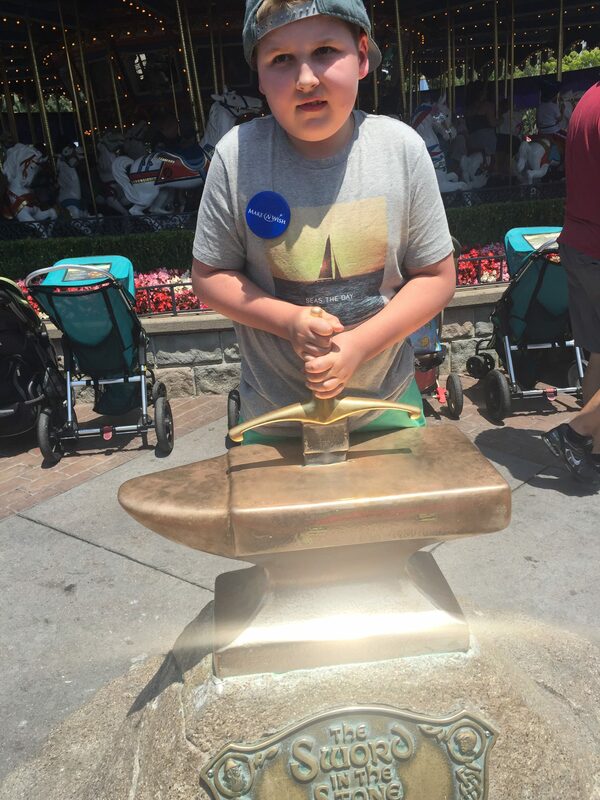 As I mentioned in my previous post, we were sent to Disneyland by Make a Wish Foundation. I mentally prepared myself before setting off by expecting the trip to be highly stressful. Turns out, it was! The first night in California was a worrisome one. Jack was awake by 3 in the morning and raring to go. Andrew and I, with red eyes and desperation only sleep deprived parents can know, tried everything short of cloroform to get him to go back to sleep. Defeated, I drew up a warm bath for Jack to splash around in while Andrew drove around Aneheim searching for a pharmacy that was open. William was still wheezing and retracting at the ribs to the point that we were worried that our first day would have to be spent at the emergency room rather then the Tiki Room. Jack splashed and squealed happily in the tub, then jumped on the beds, made pillow forts, touched every button on the radio and phone, opened every drawer, tore off the control cover for the air conditioner and finally contented himself with eating chex mix in the closet. (He’s rather a high maintenance chap, if you hadn’t guessed.) The hours dragged on until finally the sun began to rise and the other kids began to wake. Andrew found an open Walgreens and bought William some Cleratin. Andrew and I rallied our crew out of bed, praying that Jack would take a nap in the stroller and that William’s breathing would clear up. By the time all six of us were dressed and heading out the door William’s wheezing had stopped and his skin tone returned to normal. You can bet we all breathed a big fat sigh of relief at that. Our first item on the agenda was to go to breakfast at the Paradise Pier Hotel in Downtown Disney. 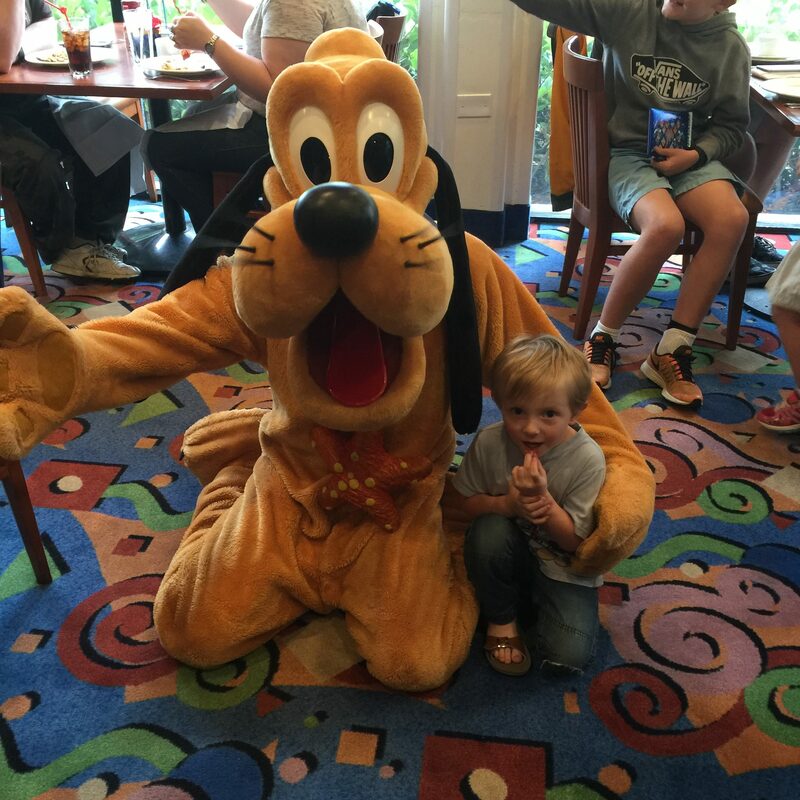 There is a wonderful breakfast buffet there where some of the Disney characters come and interact with the families who are dining there. It’s ludicrously expensive but well worth it’s weight in Mickey waffles. We would see Mickey and Minnie but the person I was looking forward to seeing the most was my dad. 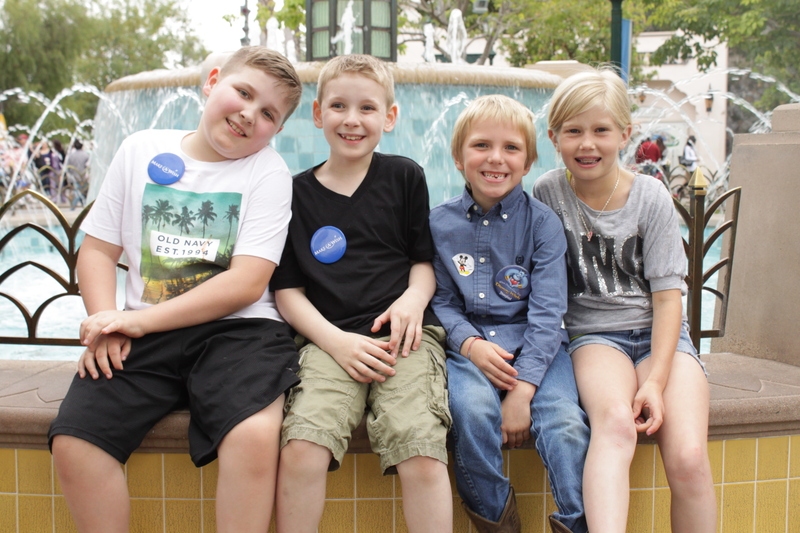 He arranged to drive from Nevada to Disneyland with some family friends to join us for one day of our make a wish vacation. I hadn’t seen my dad in nearly three years. He is Jack’s name sake and one of my favorite humans on God’s green earth. I got my looks and eccentricities from him. I said goodbye to him and moved my family across the country the another ocean such a long time ago. We waited in the hotel lobby for my dad and friends to arrive. I heard his voice before I saw his face. I heard his voice and I heard home. Then I saw him. My dad. I had missed him so long and so hard that it seemed forbidden to be with him again. I don’t know how I stayed so composed and casual when I saw him. While I sit here recounting the event, I feel a surge of panic to go back to that moment and encapsulate it forever. I am thousands of miles away from the man who gave so much and fought so hard to train me to be the person I am today. He was my dad and my dearest friend. Seeing him again for the first time in such a very long time was so comfortable and normal and yet we had both aged. A lot in some ways. We went to breakfast and had a high time of it. As Jack darted in and out of his seat trying to get another peak at Pluto and Daisy Duck, I would steal glances at my dad. I see my face in his face and my spark in his eyes. He gave me that face and that spark. My mom is precious to me in a way I can’t properly articulate; she is a delicate creature with complexity, beauty and a lingering fragrance that speaks of something exquisite and just outside of my grasp. But I am not very much like her, I think. Not as much as my sisters are. I am my dad’s clone and it was food to my soul to be near to him. He covers his mouth when he laughs and crinkles his eyes so. His green eyes. Together we made our way to Disneyland. The line to get into the park was monstrous. 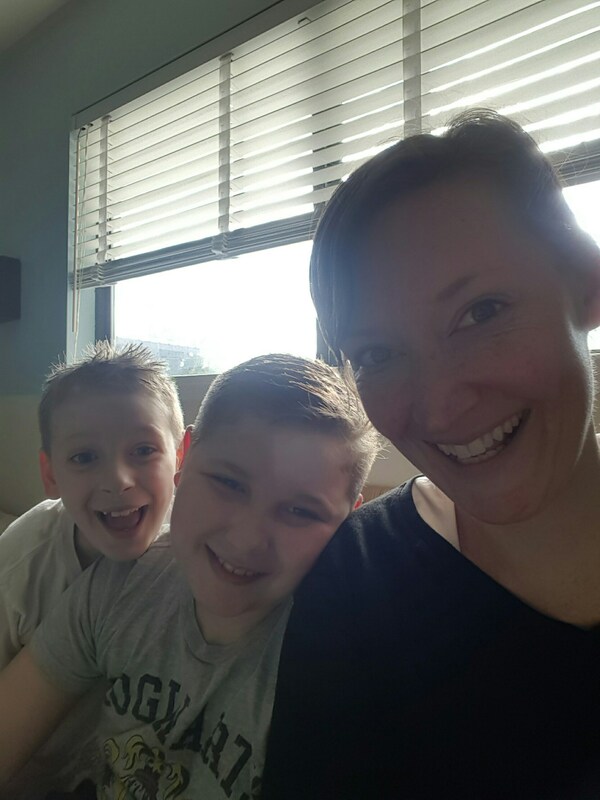 But while we stood there, being walled in by crowds of strangers, I watched my boys attach themselves to my dad. They weren’t shy or reserved about him though it had been so long since they had seen him. In fact, my oldest son, who is not terribly affectionate or empathetic, couldn’t stop toughing his grandpa. His hands kept finding their way to Grandpa’s arm or hands just to feel a little nearer. 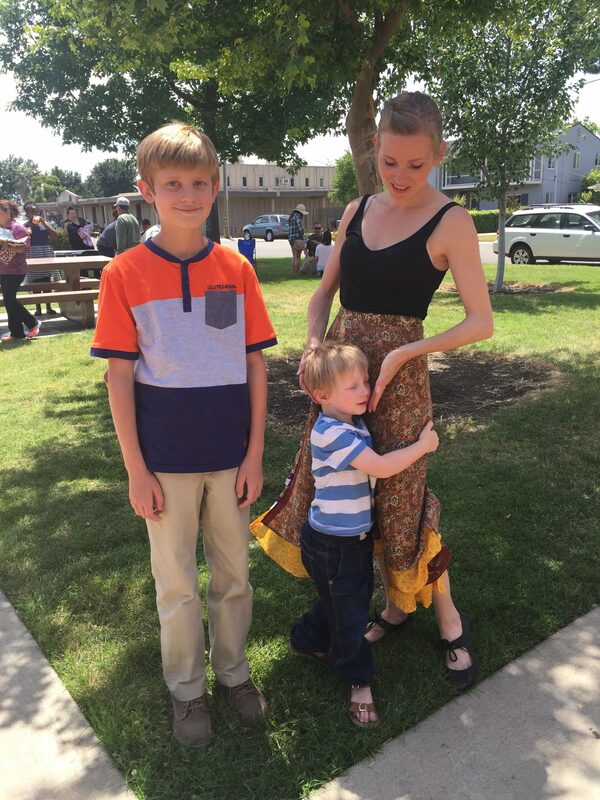 Once inside the park, we also met my cousin, Danika, and her two kids Wyatt and Gianna. They drove all the way down from Northern California to spend time with us. She and I spend time together as kids and were friends and rivals through our childhood. As women and mothers we had grown closer together and grew to love each other deeply. Having a large group of people wasn’t the easiest or most efficient way to enjoy a theme park but it was so delicious to see the faces of the people I love. Familiar faces after years of new ones is like a fresh rain after wandering the wilderness. At one o’ clock on our first day, we excused ourselves from our company and made our way to a special little lounge on Main Street called the Wish Lounge. This is a room designed to provide a quiet reprieve for Make a Wish families. They had free refreshments and a little movie playing. But best of all, there was arranged a special meeting of Mickey Mouse. 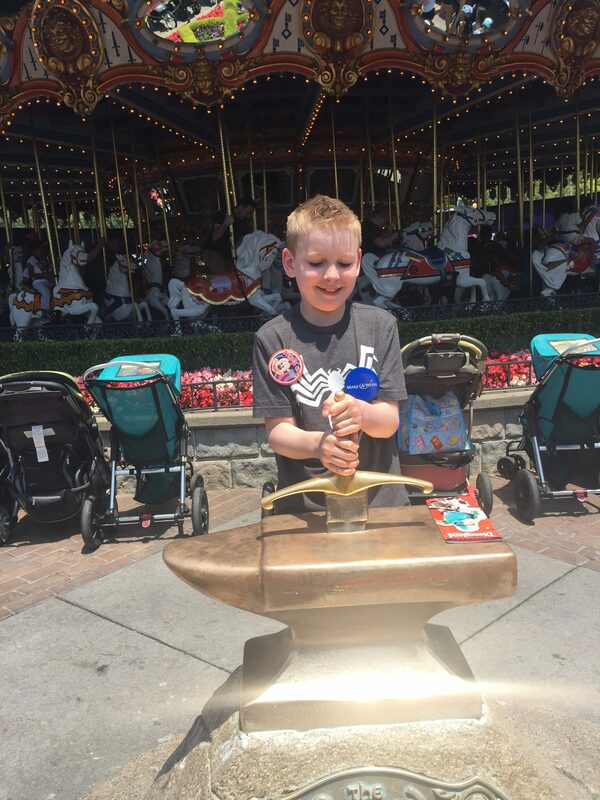 Jack really adores Mickey so when we spoke with the Make a Wish foundation we requested that Jack have the opportunity to meet him. Little did we know that Jack would get a solid half hour with him. He came into the room wearing a glittering suit for a special occasion, to see Jack. Jack’s eyes were huge and he was so overcome with joy that he couldn’t speak but could only make silly noises. 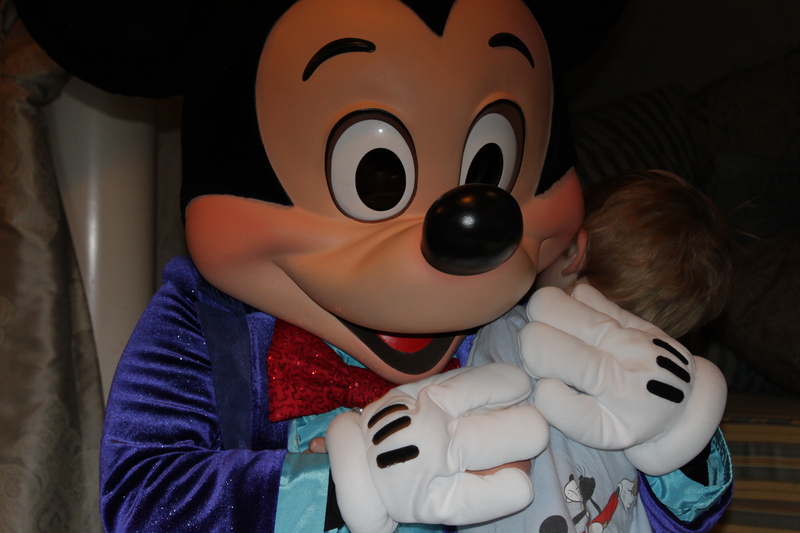 He hugged Mickey and hid from him then hugged him again. Then he proceeded to build a pillow fort out of the many pillows in the lounge. Mickey joined in and they played hide and seek with each other. They had a pillow fight and a tickle fest. I was filming this and laughing at how nutty Jack was being. Then, all of the sudden and without permission, it hit me. A torrent of emotion smashed into me. Three years ago, Jack was dying and given no hope by the doctors. And now he is rolling on the floor with Mickey Mouse having the time of his life. The tears stung my eyes and refused to be dammed up. There in front of Mickey and God and everyone I cried happy tears. Our journey with Jack had been so long and having this moment to see him getting something good out of all of the bad he had endured was more tha n I knew how to take in. The next three days at Disneyland were full of great fun and many meltdowns from four exhausted children and their exhausted parents. The last night at the park we were given a special seat reserved for us in front of the castle. We had a front row seat to the parade and following that turned our chairs around to watch the most incredible fireworks display. That night we were beyond tired as we made our way back to the hotel like battle weary soldiers who have been bombarded with more fun then a person can handle. After our Make a Wish trip was over we had several days before we had to fly back home. In that time, we used our rental car to race up to Sacramento to my sister-in-law, Erin’s, house. It was raining buckets as we unloaded our troops out of the car and into Aunt Erin and Uncle Steve’s house. Jack made it his special duty to search out all breakable objects and play with them while baby Jamie busied himself with trying to crawl into the fireplace. That aside, it was so great to see Erin and Steve (and their sweet dog Sammie). To top it off, we were able the next day to see Erin graduate with her Masters in Civil Engineering. We were so proud and blessed to be able to see her walk. What came next was quite possibly one of the things we anticipated more then anything else, even Disneyland. We got to spend the rest of the day at our best friends, The Motes’, house. Robin and Jimmy and Andrew and Laura and their kids are so dear to us and such kindred spirits. They are essentially family to us. Seeing them and letting our kids play long and hard with their kids was just as wonderful as I thought it would be. We could have stayed for days. Years even. The following day we took the kids to our church, The Bride. I say our church because, even after being gone nearly three years, we still consider this church our family. After two services full of lots of hugs and long awaited hellos we all met with family and friends at the park behind the church. There were so many people to see that we felt like we were at our own wedding, we hardly got a bite to eat we were so busy talking. 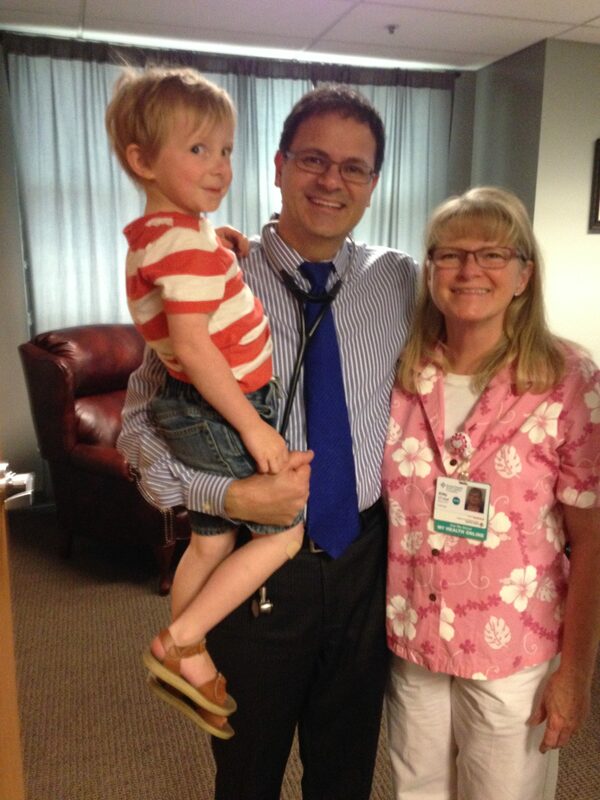 Jack was completely overwhelmed by all of the people who wanted to see this miracle boy they had prayed so hard for. He basically stopped talking for the rest of the day. After we left the office, we went to see Pastor Bob and Terry who are mentors to us. We spent the evening with them and stayed late having ice cream and savoring the last moments of time with them. Early the next morning, we packed our rental van and drove up to Ashland, Oregon to visit with my sister and her lovely family. My little sister, Heather, is my opposite in many ways and I believe that is why we love each other so much. We are dear friends as well as sisters. 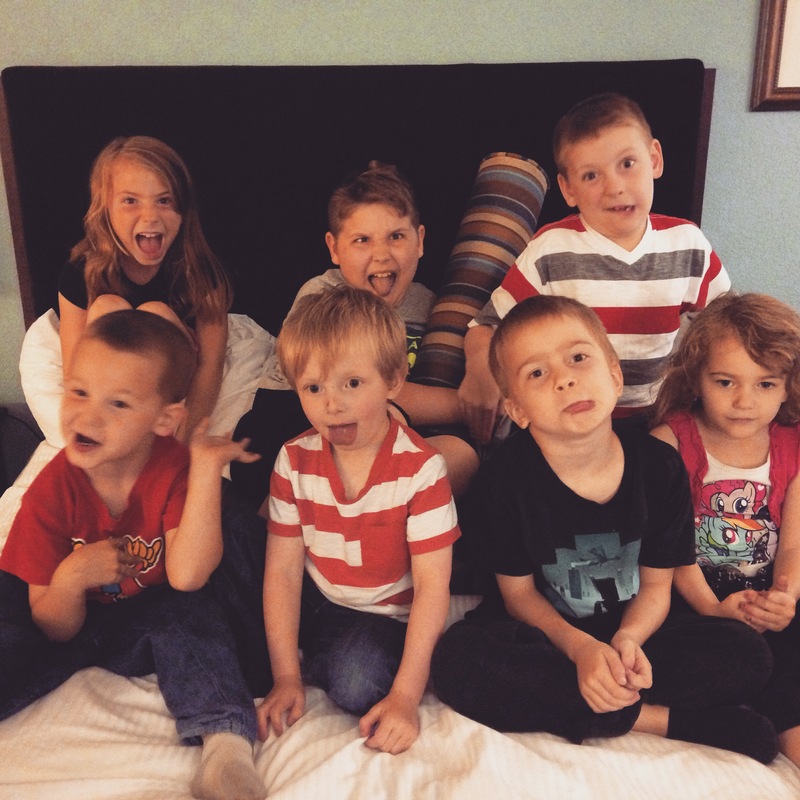 Andrew and I checked out a hotel room with a pool and had all of the cousins over for pizza and swimming. Eight kids all together and all hyper. A recipe for disaster. While the kids played in the pool and hot tub, my nephew, Jimmy, made his way to the large pool. My sister and I looked at him as he stood with his head under water and his arms flailing above the water. I didn’t know he was struggling but Heather instantly knew that he was drowning and jumped into the pool to save him. She didn’t even bat an eye, just jumped right in with all of her clothes on. I thought he was playing around but, because she knew her little boy, she knew he was desperate for air and couldn’t get to the surface. Needless to say, we were all completely shaken by this. Little Jimmy coughed a little, cried a little, vomited a little then went back into the hot tub. Like a boss. I visited with my sister until midnight. There were four large beds between the adjoining rooms and eight exhausted cousins passed out from exhaustion on them. I wish I had gotten a picture. It was a sweet sight. The night ended and I hugged my beautiful Heather goodbye, hating to see her go and wishing I could pack her and her family into my luggage and take them back to Massachusetts with me. The next morning we left the hotel my 5:30 am and began our whirlwind drive from Oregon to Los Angeles. We had a flight to catch at 10 pm and very little window for delay. 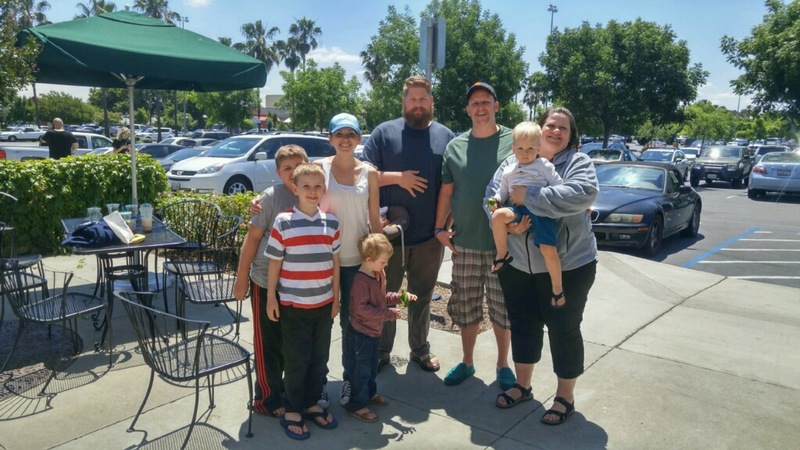 By the grace of God we were able to drive the great distance on time even though we stopped in at Sacramento to quickly see Brandon and Jeanette Smith and their little boy, Westley. We checked into our flight and flew non-stop from L.A. to Boston. It was a long sleepless night. 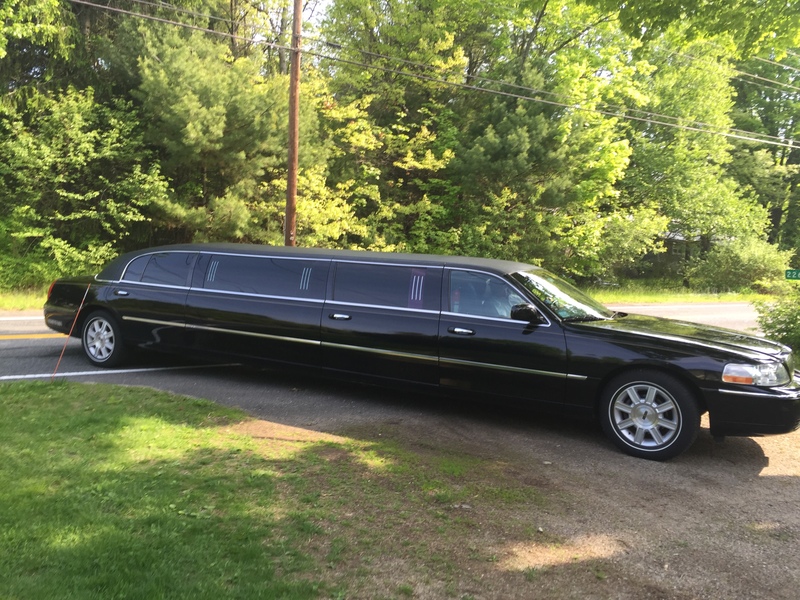 A limousine was there to pick us up, but like before, we were so exhausted we had a difficult time feeling excited. We piled in and promptly fell asleep for our two hour drive to our house and spent the next three days sleeping as much as our little ones would let us (which wasn’t nearly enough). lessing it was but I need to go get a load of laundry started. So if you will excuse me, I will be lugging barfed-on blankets into the basement to wash (or light on fire) depending on how bad they are. P.S. Pray for little Jack, he has a stomach bug.